Labour activists in two constituencies have criticised "right wing" Labour MPs amid the party's anti-Semitism row. Members in Diane Abbott's Hackney North constituency issued a motion against MPs who "slander the party" and claim it is "institutionally anti-Semitic". Sheffield Hallam members backed a similar motion and called for suspended MP Chris Williamson to be reinstated. Labour's Stella Creasy said the Hackney North motion was "disgraceful" and the local party should be investigated. The MP, who represents the neighbouring London constituency of Walthamstow, asked "what on earth is going... that such a motion can be put forward?" The Hackney North motion, backed by members of the local party by 45 votes to 35, said: "It is unacceptable to allow our representatives to slander the party and its members whilst we put them into office." It called on Labour's ruling National Executive Committee to implement "trigger ballot" procedures in all constituencies in order to allow members to decide on the future of their MPs. The motion expressed alarm at the "acceptance of the 'fact' that the Labour Party is institutionally anti-Semitic by not only the media, but the right wing of the PLP [Parliamentary Labour Party]." It adds that data suggested "a 0.08% incidence of anti-Semitic behaviour by party members over the last 10 months". Brent councillor Neil Nerva, a member of the Jewish Labour movement, says colleagues at the meeting in Hackney North - home to one of the UK's largest Jewish communities - say shadow home secretary Ms Abbott was present. Speaking to Eddie Nestor's Drivetime show on BBC Radio London, he said Jewish members were "distressed" that the MP did not comment on the motion being voted on. He added: "Now to me, that is becoming a bystander... I don't know whether Diane felt intimidated about standing up and saying what was being done." In Sheffield Hallam, party members backed a motion which also criticised claims that the party was institutionally anti-Semitic and also noted "great concern" about the suspension of MP Chris Williamson from the party. Mr Williamson was suspended earlier this week over remarks about the party's handling of the anti-Semitism row. 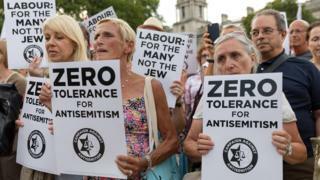 He had said that Labour had "given too much ground" in the face of criticism over the issue, but later said he regretted the remarks and did not want anyone to think he was "minimising the cancer of anti-Semitism". A Labour Party spokesman said: "We completely reject claims of institutional anti-Semitism. "Anti-Semitism complaints received since April 2018 relate to about 0.1% of our membership, but one anti-Semite in our party is one too many. We are determined to tackle anti-Semitism and root it out of our party once and for all." A party source added: "CLPs [Constituency Labour Parties] are not involved in individual disciplinary cases and can't influence them, which would be entirely inappropriate. "Rather than looking inwards and fuelling internal divisions, we should be focusing on campaigning, developing our hugely popular manifesto and working together to fight the Tories." Former Labour MP Luciana Berger accused Labour of "institutional anti-Semitism" when she quit the party to join the new Independent Group of MPs. Labour's Deputy Leader Tom Watson said the Liverpool Wavertree MP had been "bullied out of her own party by racist thugs".